Longtime Pima County residents are well aware of flooding hazards in the desert. Many have personally seen the area's normally dry creek beds become suddenly transformed into raging rivers during storm events. When flooding occurs, desert watercourses can overflow their banks and inundate surrounding areas. Major flows in area watercourses can also severely erode unprotected channel banks causing significant damage. During recent flooding events in Pima County some property owners lost buildings and as much as 300 feet of property due to channel bank erosion. Some areas in Pima County are subject to a special kind of flooding called sheet flooding . Sheet flooding is caused when flood water spreads out over the land surface, rather than running off and collecting into a defined stream channel. Sheet flooding depths can reach six inches or more. Since there is often no defined channel, the path of this type of flooding is highly variable and unpredictable. Most people are aware that the Federal Emergency Management Agency (FEMA) makes flood maps, but many are not aware that the Flood Control District also maps flood and erosion hazards. FEMA has only mapped the major watercourses, which present a significant risk to the public, but encompass less than half of the known flood hazards in Pima County. The Districts Special Study Floodplains fill in the gaps left by FEMAs Flood Insurance Rate Maps, or FIRMs. In 2011, Pima County transitioned to Digital Flood Insurance Rate Maps, or DFIRMS. To learn more about this, please visit the DFIRMs page. Information about FEMA Letters of Map Revision and Letters of Map Amendment can be found on the LOMRs CLOMRs and LOMAs page. Even a small amount of water entering your home can cause significant damage. The Federal Emergency Management Agencies Flood Cost Estimator can be used to see just how quickly the cost can add up. Crossing a flooded wash while driving, even with depths of less than 2 feet, can float a car. Here are maps showing road accessibility during floods for Pima County. Pima County regulates all unincorporated areas lying within the 100-year floodplain. 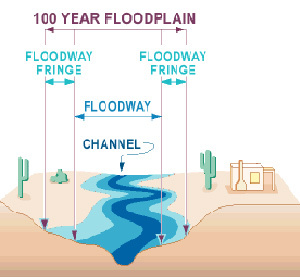 The 100-year floodplain is defined as the area adjoining a watercourse that would be covered by water during a flood event having a 1 out of 100 chance (1%) of occurring in any given year. Of course, floods of differing magnitudes -- smaller or larger -- could also occur, each with their own probability of occurring during any one year. An important first step in evaluating the risk of possible flood damages is to determine whether a property lies within the 100-year floodplain. Floodplains and channels can change significantly over time, whether due to large flooding events on human alteration of the landscape. A comparison of the Agua Caliente Wash floodplain from 1960 to 1994 illustrates these changes well. There are several methods by which you can obtain county floodplain status information for your property. A map of known flood hazards is available. This map shows FEMA and known locally mapped floodplains and regulatory washes within unincorporated Pima County. It is provided for general information only and may not be adequate for permitting purposes. Not all areas subject to flooding are shown on the map. Erosion hazard areas are not shown on the map. The accuracy of delineations, including the delineation of regulatory washes, is not guaranteed. FEMAs Digital Flood Insurance Rate Maps (DFIRMs) are available on our DFIRMs page and FEMA approved map revisions are available on our Approved LOMRs CLOMRs and LOMAs page. Fax Back Service. You can request floodplain status information for a parcel by either faxing or mailing a floodplain status request to us. To process a fax request, you should fill out a Flood Hazard Information Form. To complete your request, simply print out the form, fill in the requested property information, and then fax (or mail) it to us. Copies of the form are also available at the District's offices. When using our fax or mail service, be sure to include your name, the address of the property and the property tax code or legal description. You should also provide a daytime telephone number in the event we need to contact you for any clarifications regarding your request. Our fax number and mailing address are included on the form. Turn around time for fax and mail requests is typically 5 to 7 working days. Floodplain Service Counter. The District also staffs a floodplain service counter located in our offices. Make sure to visit our service counter to find out if your property is subject to flooding, to determine if you need a floodplain use permit, or for any other flood-related questions you may have. Please note that the District provides flood status information only for unincorporated portions of Pima County. For similar information on parcels located within the incorporated areas of the City of Tucson, Town of Oro Valley, Town of Marana, the City of South Tucson, and the Town of Sahuarita, please check our Other Flood Control Jusrisdictions page. Floodplain status information is an essential component of our mission. The District typically receives between 8,000 and 10,000 requests for floodplain status information each year.